The Thera-Band Assist Attachment Device has been designed to offer you a comfortable and practical tool for your physical therapy needs. The Thera-Band products are excellent for use in both a clinic and home environment. TheraBand Assist Attachment Device simplifies the use of elastic bands and tubing. 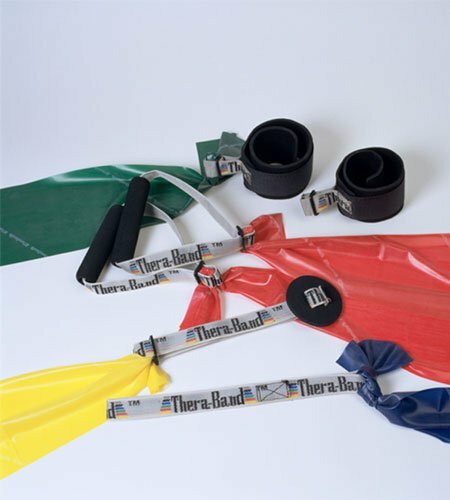 The TheraBand Assist Attachment Device can easily connect to authentic TheraBand elastic resistance products. Increased Exercise Range: The Assist Attachment Device can be used in a wide range of exercises that can be performed with tubing and bands. Easy Attachment: Loop one end around an arm or leg and attach the tubing to the other end. Increases Grip Strength: Users with poor grip strength can use bands and tubing in rehabilitation programs. Contains 1 TheraBand Assist Attachment Device.